I receive this NAKED 2 from my Love on my birthday. To those who miss out my post about my birthday. You can click it here❤. Ok let's back to the topic about this before I start talking crap here. I've been using this NAKED 2 since the day i receive it on my birthday. There's 12 colours. In matte, shimmer and glitter textures. Ok let me show you picture of the very pigmented colours and the swatches of all the colours on my hand. I have use the colour of FOXY, BOOTYCALL, TEASE, SNAKE BITE and BUSTED ﻿to create the smokey eye. Of cause, not to forget, before i apply the eyeshadows, i apply my Urban Decay Eyeshadow primer potion first and then i start to apply the colours. Sometimes, i just play around with different colours to create the heavy smokey eye look. And also sometimes can even give me a hard time to decide which colours to apply as it got so many colours. This is the look that i use from the NAKED 2 to create the smokey eye whenever i'm heading out on a date with Love. It came with double ended brush. If i'm not wrong, the last time I saw this NAKED 2 cost $80. You can get it at any Sephora. That's all for now. Shall end my post here. Stay tune for my next update. 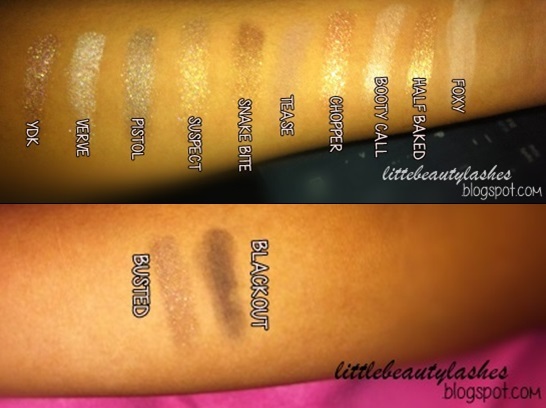 I think on pretty much every blog I read they have a naked palette, I really need to get one!